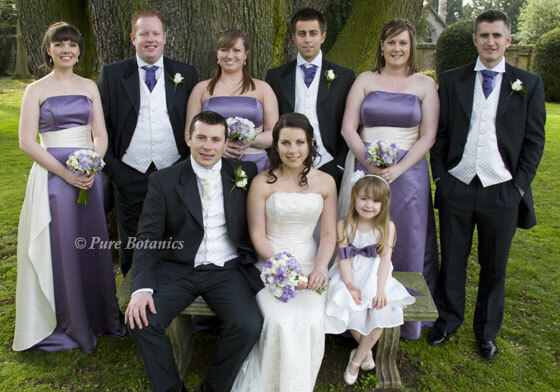 Over the last few years purple wedding flowers have become increasingly popular. 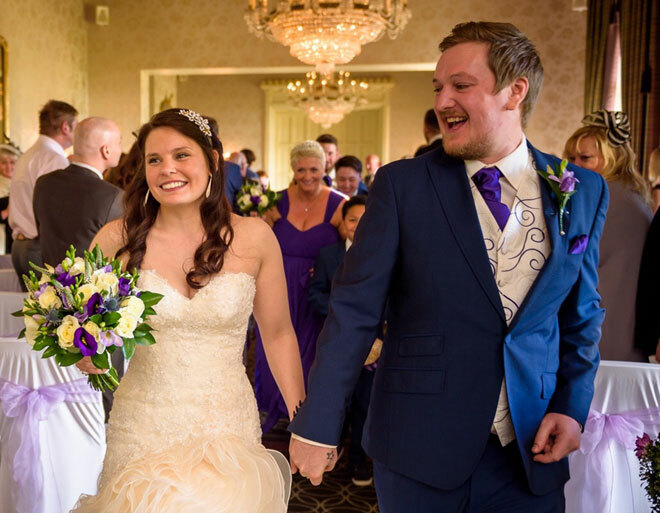 The main reason for this is brides have been choosing purple bridesmaid’s dresses and it’s natural to follow that theme through to the wedding flowers. There are lots of shades of purple from delicate lilac through to deep purple. I often combine purple with other colours such as ivory white and there are many examples of this in my photos on this page. 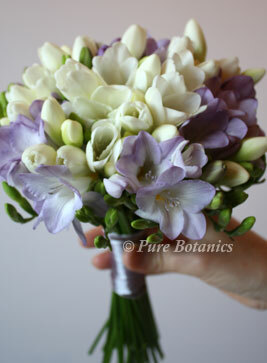 This can give you a pretty soft look and the white flowers makes the flowers stand out in front of a purple dress. 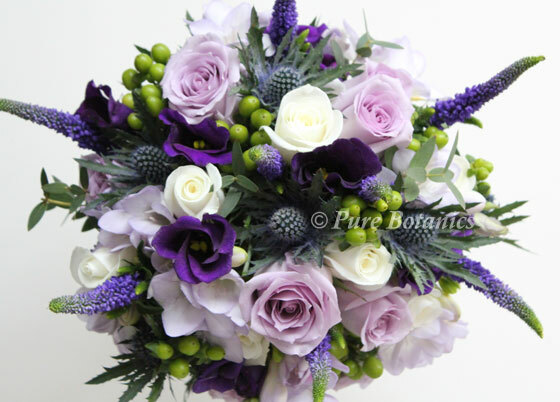 The lilac purple rose called ‘Pacific Blue’ is a popular choice. 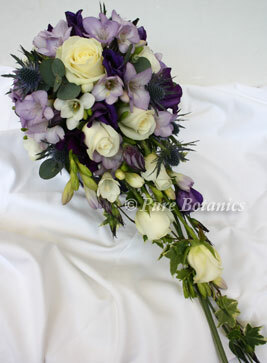 In Andrea’s wedding bouquet (2 photos below) you can see how I’ve combined it with blue thistle, deep purple lisianthus, veronica and lilac freesias. 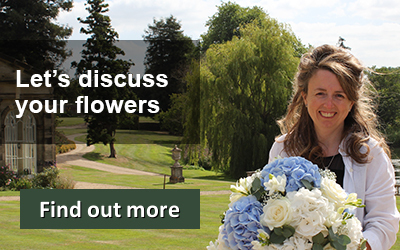 Flowers at different heights and textures help to give the bouquet that lovely vintage natural English garden look. I’ve also combined purple with stronger colours such as blue. 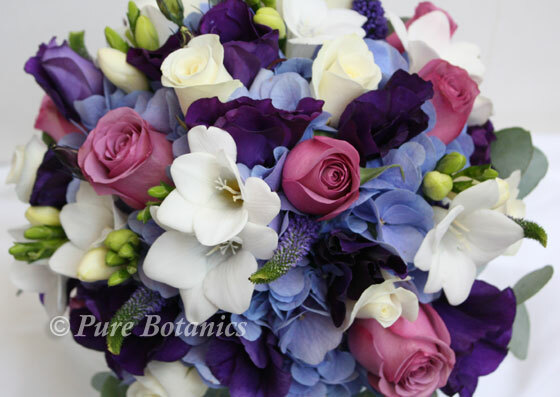 You can see in the bouquet below how I used the blue hydrangea and combined it with pinky purple ‘Cool Water’ roses, deep purple lisianthus and ivory freesias. 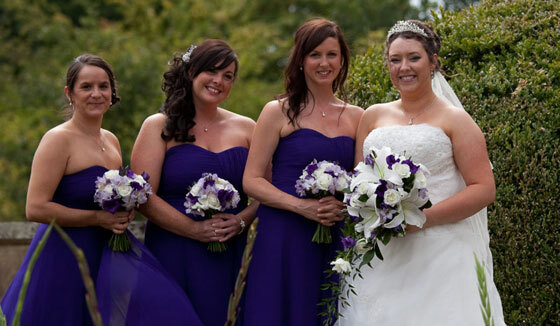 Another strong colour combination is yellow and purple (photo below left). 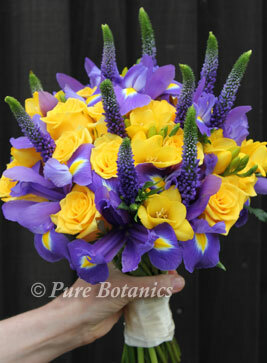 I recently provided this stunning purple iris and yellow rose and freesia bouquet for a bride at Stoneleigh Abbey. 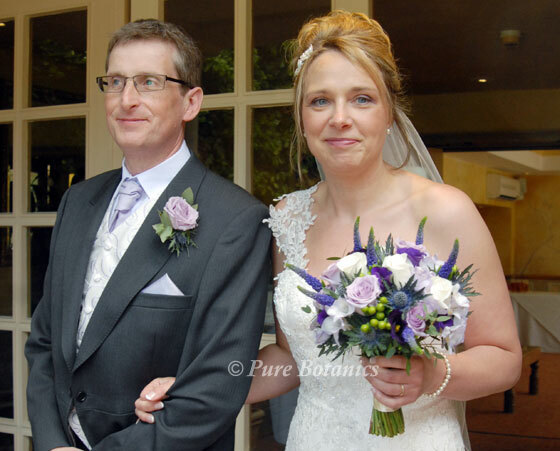 Camilla (the bride) loved the deep rich shade of purple in the iris and I picked up the complimentary yellow colour from the detailing on the iris. 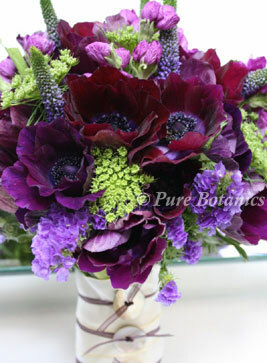 I often use deep purple lisianthus when we are working on a purple wedding flower theme. 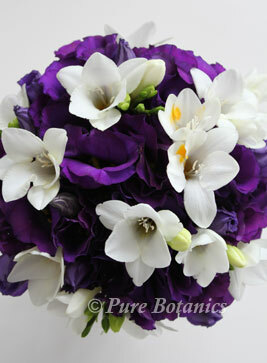 Above right, you can see how I used hundreds of delicate purple lisianthus flowers with ivory white freesias. 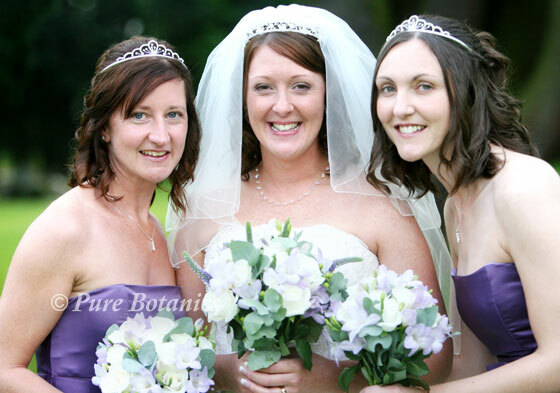 This was a stunning bridal bouquet that matched perfectly with the bridesmaids’ dresses. One of the flowers that are the closest to that rich dark ‘Cadburys’ purple colour is the anemone. 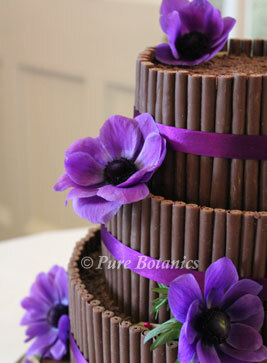 You can see in the photos below how I used it on the side of a chocolate wedding cake. 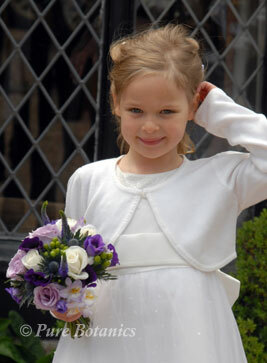 In the photo next to it is the flower girls posy bouquet. 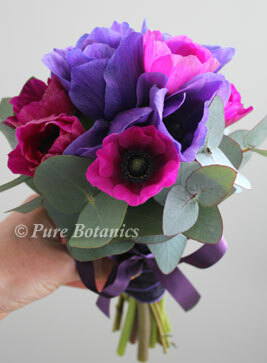 For this I combined the cerise pink and purple anemones finished off with a coordinating purple satin bow and handle. 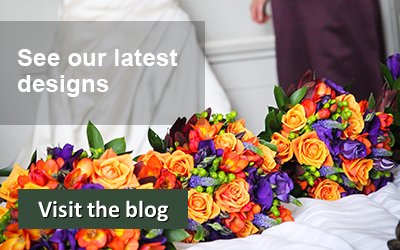 If you are planning to have purple wedding flowers, come and discuss your ideas with me and we can plan flowers that fit perfectly with your wedding colour theme.